It started out simple enough, come up with some ideas for the next gallery show themed "All Animals Great and Small". So I did what I know I am supposed to do and began drawing small thumbnails. So with that in mind I set the thumbnails to a scale that would allow them to be longer. I based the measures off of actual artwork I had purchased and have hanging up in my home. The plan was a 1:3 ratio. And off I went. Did I want to make a sloth, like my niece suggested? Or something with dogs, cause I love them? All could have been nice but I kept thinking of coming up with a way to include air, land and water animals. And then I remembered that saying of go with what you know. And I know about the North Woods from vacationing there over the years since I was a kid. 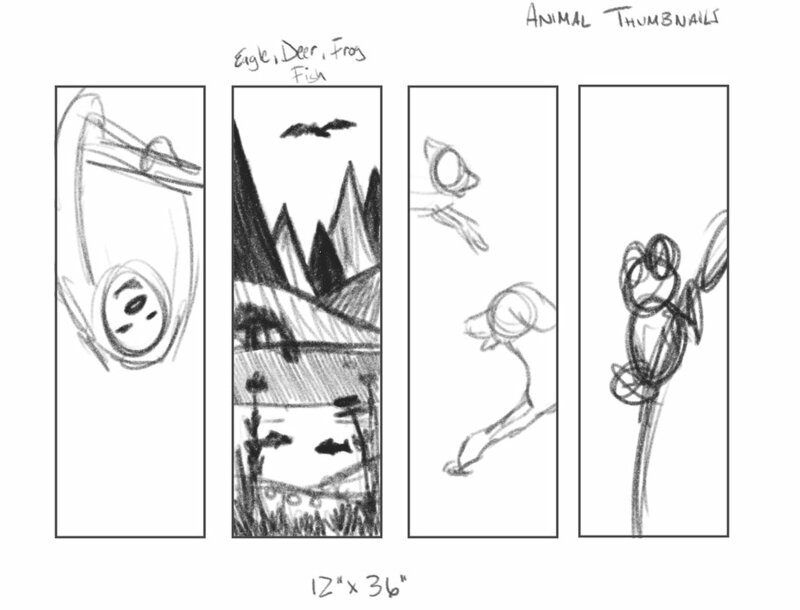 And that is when I began sketching the simple thumbnail where I could feature an eagle flying, a deer getting a drink, fish in the water and so on. Once I had this very rough little thumbnail, and even before I spent time refining the drawing of it I started playing around with color schemes and created a series of color studies. Ten of them to be exact. I had a favorite or two but thought I would put them up on social media and see what friends/peers had to say. And before I knew it I had comments flying in with votes on the favorite color scheme. And some suggestions for making more than one and so on. When all was said and done the results of the voting turned out like shown below. Two of the schemed tied for first place with a close third and somewhat close fourth. 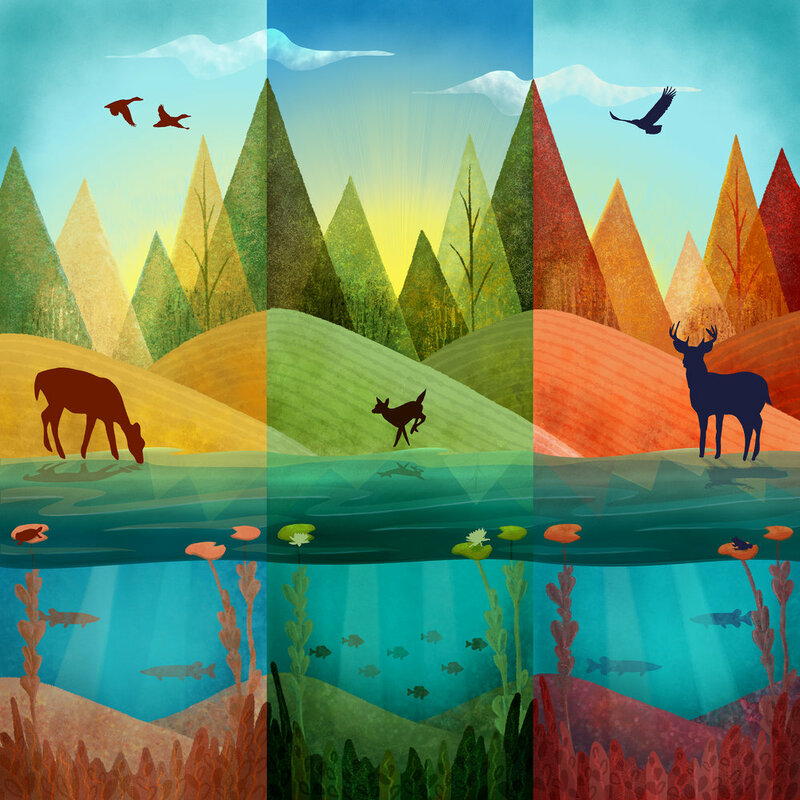 As I mentioned earlier a few of the comments said I should do multiple versions or maybe even a triptych. And the more I thought about it, the more I liked that idea. So at first I expanded this into a series of 3 panels now featuring a doe, fawn and buck. But the more I looked that this combination of colors the more I realized there needed to be more harmony in them than that. So instead I used the favorite color in the middle with a slightly darker sky. The second favorite on the right and the fourth favorite on the right. And now it looked like Spring, Summer and Fall. After that I got to work and started building in various textures, layers of colors and light. Then for fun I compared the original color study thumbnail, the cleaned up color study and the final image to see how true to the colors I remained. And while there are a few deviations, for the most part I kept them awfully true to plan! With the art completed it was now time to work on printing each panel onto canvas. For this step I included a two inch border of very dark brown around each panel. This is what will appear on the sides of the piece once the canvas is wrapped around the stretcher bars. The prints were setup for 10"x30" and once they were done printing, I have to let them dry/cure for 24 hours before I can move onto the next step. I never like the waiting part but it's important for the longevity of the art later on in its life! After the 24 hours was up, it was time to varnish them. They each get 3 coats of varnish that is specifically designed for ink jet inks. You need to allow 30 mins between coats and then 2 hours after the final coat. At which time you need to stretch them onto the canvas. I use a great stretcher bar system called Simply Elegant, which I order from a company called Atlex. After I made pencil lines on the back of the canvas to ensure my artwork would line up on the face of the panel, I follow the steps to wrap them on the bars as shown here. And then it's time to flip them over for the big reveal! The completed set of panels. After verifying everything looks good. Then I flip them back over to put on the finishing touches. The dust cover, hanging wire hardware, rubber bumpers and so on and off to the gallery they went! The last piece of the Puzzle!